Rolled ice cream is a sensational Thai frozen dessert. Unlike most ice creams made ahead of time in an electronic ice cream machine, rolled ice cream—also known as stir-fried ice cream—is made to order by hand. According to Forbes, street vendors in Thailand, Malaysia, Cambodia, and the Philippines can whip up this frozen treat in about 2 minutes. The ice cream is made by pouring a base of sweet milk on an extremely cold (-35°C) steel surface that resembles a pizza pan to Westerners. Paint scrapers or metal spatulas are then used to chop toppings into the base and scrape it around to create air. Once the base is frozen solid, it is spread thinly and scraped at an angle to create the magnificent rolls of ice cream. The rolls are then placed carefully in a cup and topped with items like whipped cream, chocolate sauce, and fresh fruit. No, you don't need to buy an international plane ticket to get your hands on a cup of rolled ice cream. You may need a domestic one, though: currently, rolled ice cream can be found in only a few major US cities. 10Below Ice Cream has a few locations in New York City (but are coming soon to Philadelphia and Los Angeles). Meanwhile, Chelo Creamery is rolling up ice cream in Southern California and Class502 is holding down the (rolled) ice cream fort in Houston. Keep an eye out for rolled ice cream in your neck of the woods, though—it won't be long until this trend sweeps the entire nation. Until you have enough cash saved up for your next trip to a city with rolled ice cream, you can thankfully satisfy your cravings at home! Thanks to the YouTube channel Ice Cream Rolls, we have a simple DIY tutorial for making rolls of ice cream in our very own kitchen. Sure, we would all love to experience the sight of someone artfully chopping and scraping ice cream up right before our eyes, but it'd be even more satisfying to scrape up your own rolled ice cream. 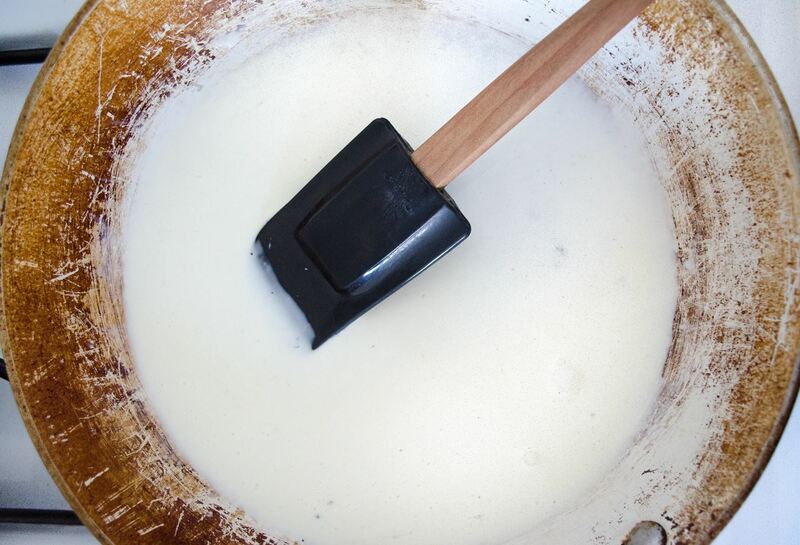 Begin by combining the milk, heavy cream, sugar, and salt straight into a large metal skillet. Use a heat-resistant rubber spatula to stir everything together. Place the skillet on the stove over high heat. 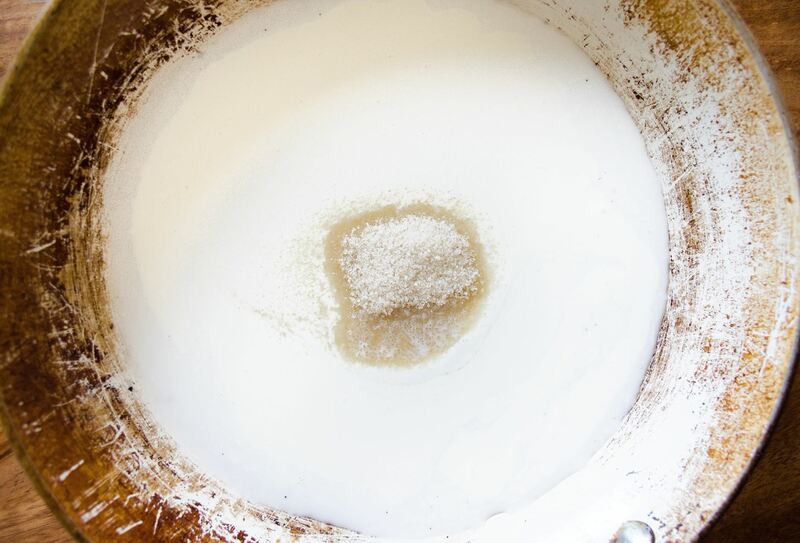 Continue to stir while the milk heats and the sugar dissolves, or else your sugar might start to burn on the bottom of the pan. Continue stirring until the mixture comes to a boil, then remove from the heat entirely and let the mixture cool to room temperature. Once the base is cooled, sprinkle your topping of choice over the ice cream base. You may choose to use toppings such as sprinkles, Oreo cookies, brownies, fresh fruit, Nutella, and so on. Use the paint scrapers to chop up the toppings and mix them into the ice cream. Moving around the ice cream base will create air, which will yield a creamy, well-textured ice cream. 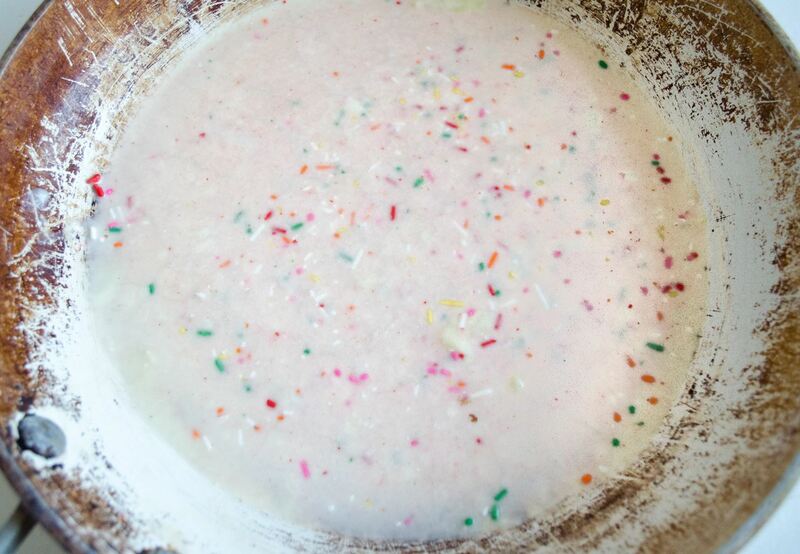 Once the toppings are incorporated into the ice cream base, place the skillet into the freezer for 4 hours. The ice cream needs to be extra frozen in order to scrape it into rolls. So when that third hour hits, please, be patient—or your ice cream will end up a soggy mess. This step is crucial! Place the bowl you will be using to serve the ice cream and the paint scrapers used to scrape the rolls into the freezer for at least 15 minutes. Once the ice cream is out of the freezer and scraped up, it will need all the cold it can get. If you decide to skip putting the bowl in the freezer, your poor ice cream rolls will melt away faster than you want them to. Do it for the rolls! Step 5: Roll 'Er on Up! 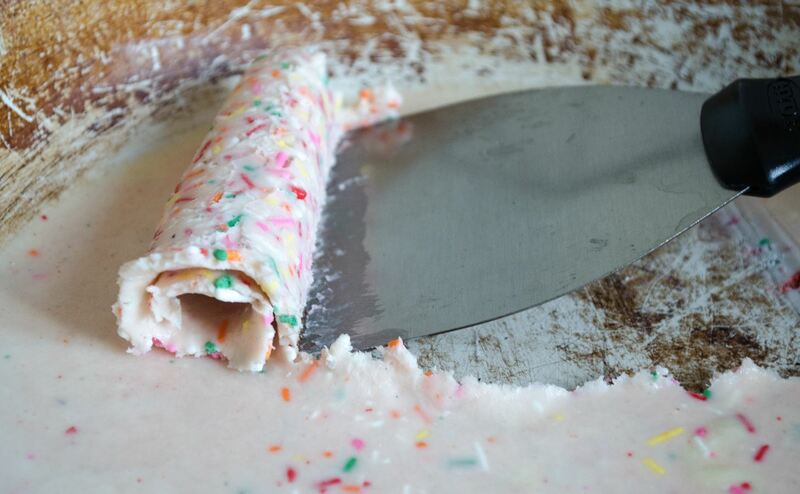 Once your ice cream is frozen solid along with your bowl and scrapers, it's time to make some ice cream rolls! Before you take the skillet out of the fridge, you must be warned. Serious faces everyone. This is not a time to dilly-dally—you must act fast from the moment the skillet comes out of the freezer and touches the kitchen counter. 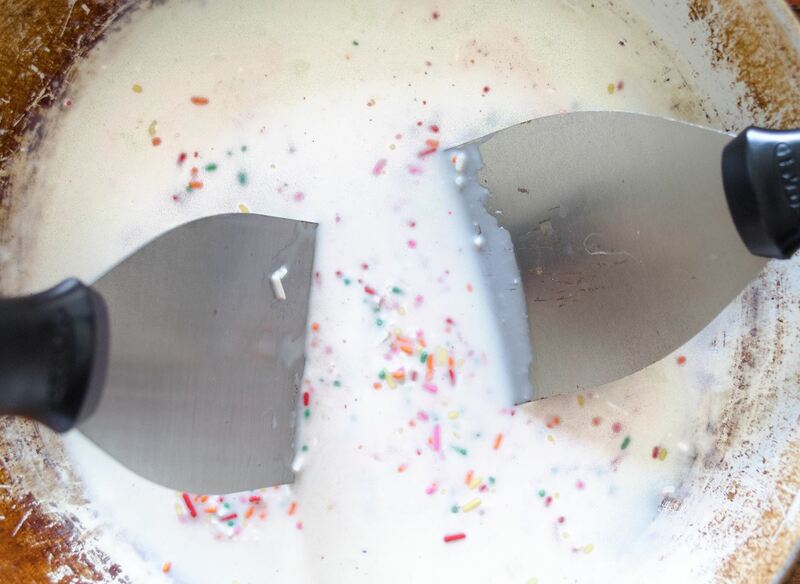 Quickly scrape the ice cream into rolls by placing the paint scraper at an angle against the edge of the pan, pushing carefully forward. If the ice cream needs a little help forming, use a butter knife to push the sheet of cream into the roll. Set the ice cream rolls gently into your frozen bowl. Then, top it with whatever you please—more sprinkles, whipped cream, fudge, caramel, or fresh fruit. Don't forget the most important step of all: getting a gorgeous snap to share online. Now dig in and enjoy your hard work! 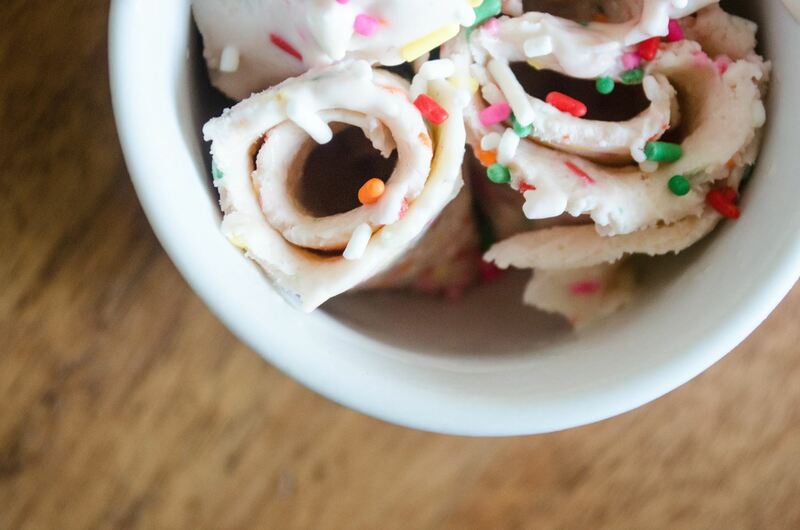 Ice cream rolls are fun, but a little tricky. If you want to achieve the magic of rolled ice cream at home, without having to travel to one of the few ice cream shops in the world that are rolling up ice cream—and without buying an expensive Anti-Griddle—you must follow each step precisely and work fast. If you are able to do just that and have conquered ice cream rolls, cheers to you! Let us know how your rolls turned out by commenting below.